Entspannende See direkt am Ufer des O die Kiefern in der Nähe Jefferson, Tx. 2 Schlafzimmer, 2 Badezimmer mit großen abgeschirmten Veranda und große Terrasse mit Blick See. Braleys Bungalow liegt am Lake O the Pines in der Nähe des Dam nur ein paar hundert Meter von einem Jachthafen mit Bootsanleger entfernt. Lake O The Pines ist bekannt für seine großartige Fischerei; Erholung; Vogelbeobachtung und Entenjagd. Das Anwesen verfügt über einen großen privaten Dock für Ihre Freizeit. Zur Ausstattung gehören: komplett eingerichtete Küche (bringen Sie Ihr eigenes Essen), Mikrowelle, Waschmaschine und Trockner, Flachbildschirm-TV mit Dish Network und Blue Ray DVD-Player, Kamin, Außengrill, Feuerstelle im Freien, in der hinteren Veranda mit großer Terrasse, zwei Schlafzimmer geschirmt und zwei Bäder. Es ist nur 11 Meilen von Historic Jefferson, TX, 60 Meilen von Shreveport, LA, und 30 Meilen nach Longview, TX entfernt. Nur eine 15-minütige Fahrt nach Historic Jefferson, die Einkaufsmöglichkeiten in Antiquitätenläden oder Geschäften, die eine einzigartige Gegenstände bieten, Pferdeschrift erzählte Kutschfahrten, hausgemachte Fudge-Shop, Blackburn Sirup Outlet-Shop, Museum voller historischer Erinnerungsstücke, Jefferson General Store, Flussfahrt auf dem Bayou, Zugfahrt mit der Historic Jefferson Railway, Ghost Walk Tours, zahlreiche Souvenirläden und köstliche Restaurants mit Josephs Riverport Barbecue, Hamburgerladen, Lamaches, Kits Kornbread, The Franchise, Knightlight Theatre und anderen Restaurants um deinen Hunger zu stillen. Die Touren sind für Historische Häuser zur Verfügung. Auch in der Nähe verfügbar ist, Kanuverleih zu schweben nach unten Big Cypress Bayou. Verbringen Sie eine erholsame Woche oder ein Wochenende in unserem ruhigen Zuhause, genießen Sie eine Tasse Kaffee am frühen Morgen auf der abgeschirmten Veranda oder sitzen Sie auf der Hollywoodschaukel und hören Sie den Vögeln zu und genießen Sie die schöne Aussicht auf den See. Gute Möglichkeit, um zu entspannen und die Natur genießen. 11 Meilen von historischen Jefferson die Vorkriegsvillen, Kutschfahrten, Ghost Walk, Zugfahrt, Antiquitätenläden und gutes Essen zu einer Vielzahl von Restaurants. 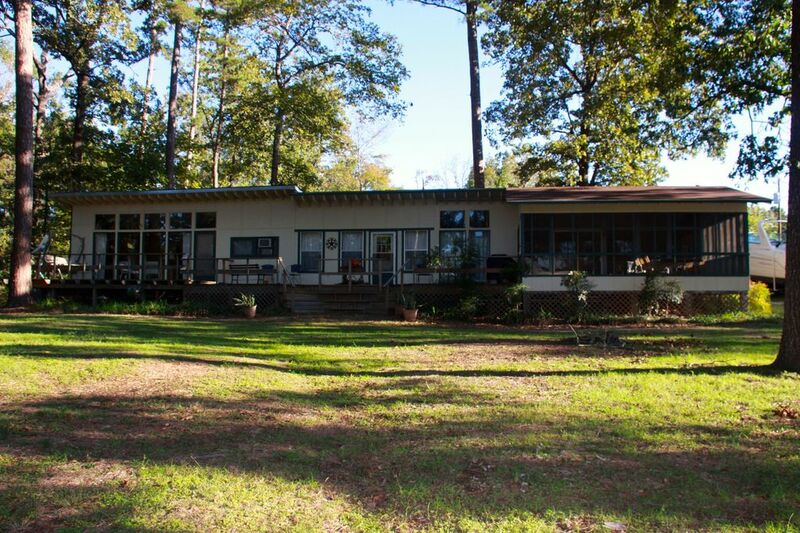 This lakehouse is located right by the owner's home and the owner's son, who is in the construction business. Upon arrival, there were several men walking or working large equipment around their property. The owner came by on his golf cart and greeted us upon arrival. The lakehouse is kept very clean, and there are lots of thoughtful gestures throughout, such as an ice chest filled with ice in the kitchen. The kitchen was stocked with all the pots, pans, utensils you would need and also lots of seasonings. The bathrooms were nice and spacious with new tiled showers and included towels, toilet paper, and even shampoo. We enjoyed sitting out on the large deck enjoying the view of the lake through the pines. At night, we had a campfire in the firepit but the loud operating of machine/tools next door, it was difficult to enjoy the peaceful night. The owners frequently drive their golf cart around in our backyard (by the deck) and check on things. They are friendly and trying to be helpful (checking to see if my husband caught fish, bringing fish food by, messing with the bird feeders, etc) but we lost a sense of privacy that we were really hoping to find there. On the next to last day, it was rainy and my kids asked if we could just stay in and play games and watch movies in our pjs. We were in the living area watching a movie and my daughter said, "Mom, that lady" pointing at the window. I looked over and the owner was on the deck waving in our living room window. I opened a door and she asked me to sign her receipt, which we had already paid in full, and I have never had to do this in all the VRBO's we've ever stayed at. This house is their baby. If you don't mind a watchful owner that visits frequently, this is a nice house to stay. The owners were so nice! Everything was as she said and more! We even had Christmas trees and presents from them!! We really enjoyed having y’all as guest and look forward to seeing y’all in future! This cabin is fun and eclectic. Ping pong, board games, corn hole, and fully stocked cabin for a family get together. The owners live across the driveway so they made sure we had everything we needed and restocked the wood pile so we could enjoy the fire pit. The dock was perfect for fishing even though it was too cold to catch anything and the trees were beautiful. We had a great time! It was so great having your family stay at our Bungalow! Your boys were so polite and helpful. Hopefully y’all will return in the future and the fish will be jumping on your hooks! Thank you for you and your husband’s service to people! Absolutely beautiful place. Clean and the owners are amazing people!! My daughter got married in Jefferson on November 3rd. Our family came from Oregon and New Jersey and different parts of Texas. This property allowed us to all spend time together as a family which we are rarely able to do! The Braleys made us feel like family and we will definitely be staying there again! Ya’ll were amazing guest and it was such a joyous occasion for your family to join together to celebrate your daughter’s wedding! Thank you for your gracious review and we look forward to having y’all back as guest! We brought a group of 9 fisherman and the house was perfect for us. Plenty of room for boats and trucks with a ramp just down the street. Kitchen was fully furnished and all the house was very clean. We really enjoyed having your group stay at our Bungalow! So glad it met your needs. Hopefully we will see y’all in the future . Mandatory 10 day cancellation policy for full refund. 20% processing fee for all cancellations within 10 days of reservations. Absolutely NO PETS ALLOWED. Additional charges will be added to credit card for damages and missing towels, linens, etc. Cash, MasterCard, Visa and Discover cards accepted.